Consider the following: you decided to implement an accounts payable solution and even have signed a contract with the software vendor. When the contract is signed, each party is supposed to know its counterpart’s obligations and responsibilities as well as their own ones described in the agreement. The contract helps stakeholders understand results expected upon the project completion. Signing an agreement though, is just the beginning of the whole implementation process, which is quite complex and phased. That is why it is crucial for vendors to build customer communication into their software implementation methodology. Lack of communication may easily lead to missed expectations, requirements, etc. Also, a well-organized customer communication ensures the visibility that allows clients to know what to expect throughout the implementation. What is happening to your company during the whole implementation period? 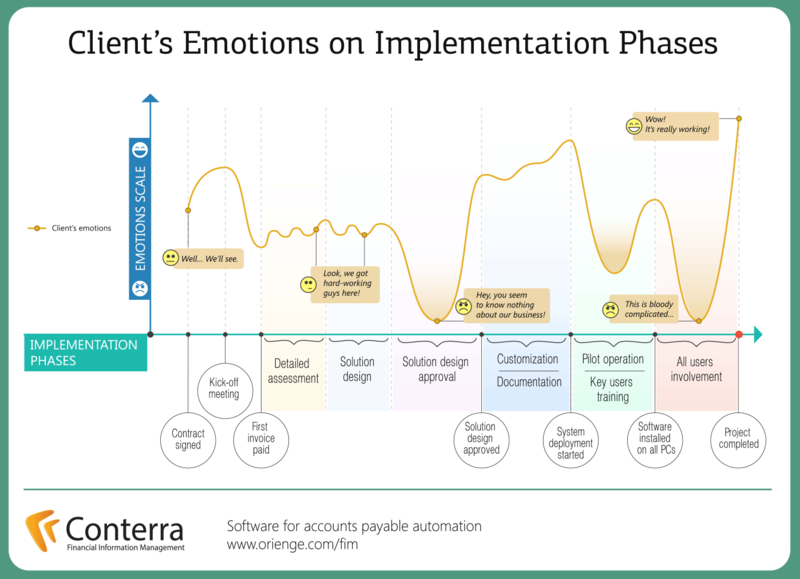 I would like to explain you the main phases and milestones of the overall implementation process using an example of our accounts payable automation solution Conterra FIM. 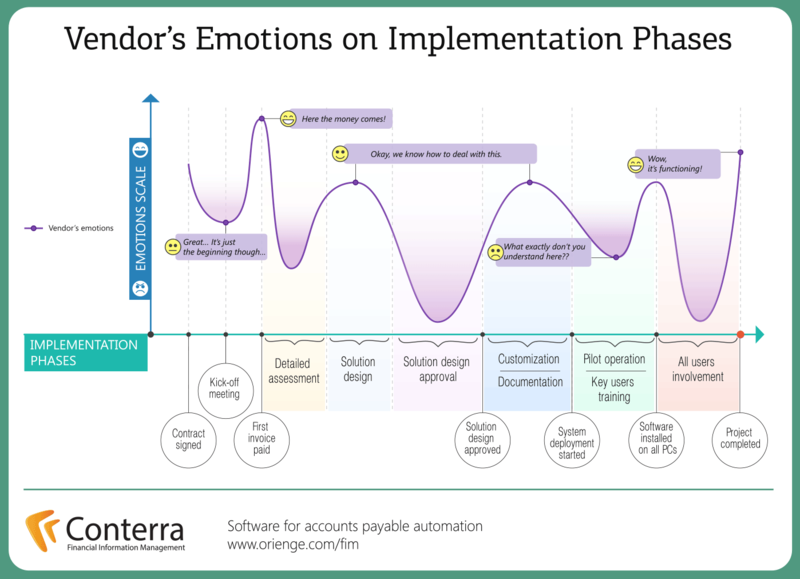 We have already seen how customers’ and vendors’ emotional states change during the project implementation. Now, if we compare the two emotion diagrams, we’ll understand at what points vendors and customers feel alike, and when their emotions are out of tune. See and enjoy our infographic! Are you afraid of a new software implementation? Wondering how you will get through? Don’t worry! Just think of all the advantages that the new technology is going to bring to you. You’ve finally signed a contract with a customer. Congratulations! But it’s not the time to relax. There is still much work to be done before you see the solution operating properly. 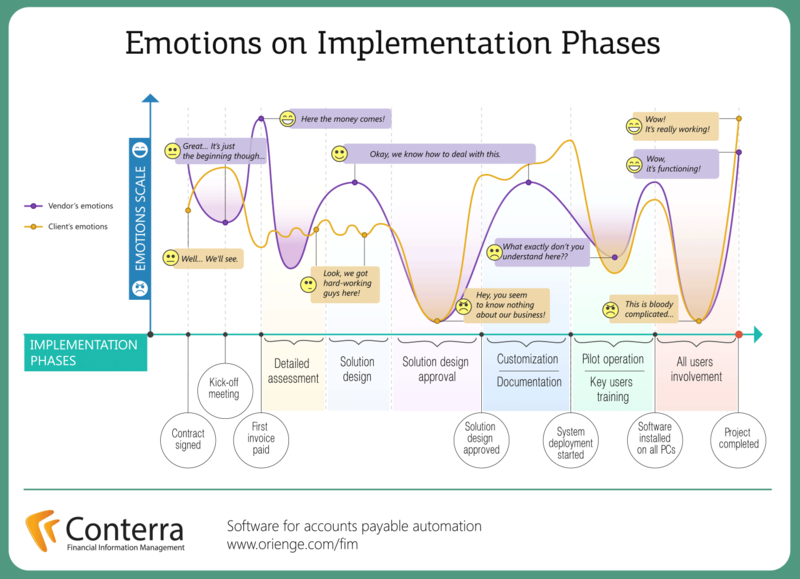 We have put together all the experience that we have, and created an infographic showing how vendor’s emotions change during the implementation process. A good product is just a small piece of a successful business process automation puzzle. Implementation is often played down by some companies. If so, you get just a well-written code and a look and feel of the user interface. Even areas of business activity like Accounts Payable and Invoice Management with pretty clear business processes and a small number of participants require a strategic approach and a qualified implementation.